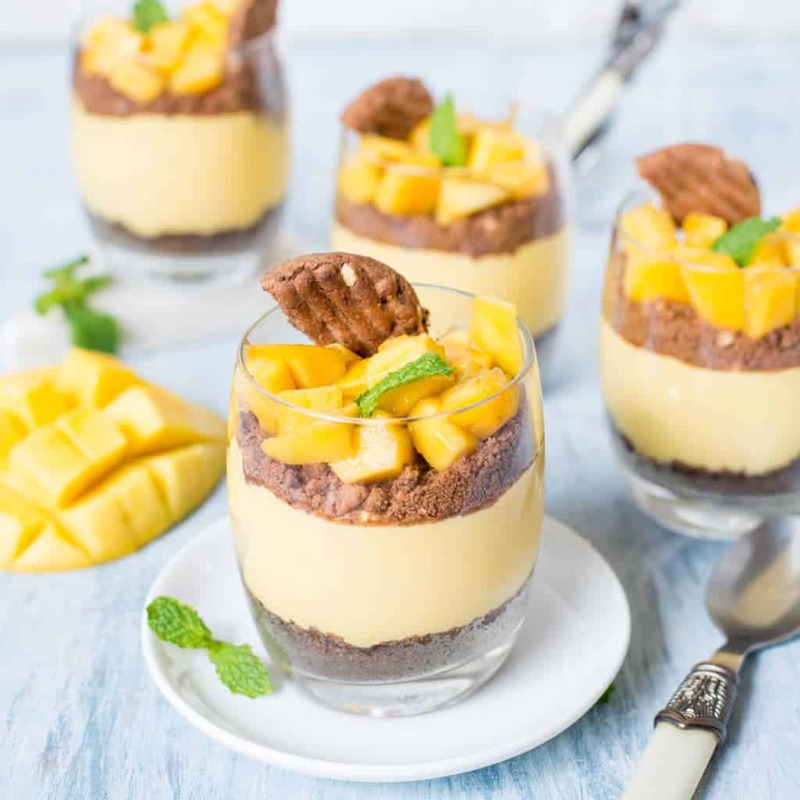 Mango CheeseCake Parfait : Yet another mango recipe, Because I want to make the most out of mangoes before they are gone.So there are chances you might see few more mango recipes in coming days. 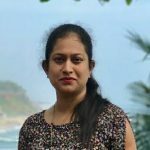 I am back to work, I didn’t even realise how one month has passed away. Back to work means again the same schedule – office,home,blogging and photography. Hope post vacation I will be able to balance everything more efficiently. Deb’s Parents are home and we are having a nice family time @home. When I say family time, it is incomplete without good food. My father-in-law being a great foodie, always cherish good food. He is always ready to explore new dishes. So whenever he is at bangalroe, I try my best to prepare different dishes. Watching him enjoying my food, gives me a great satisfaction. I am glad that Deb has inherited that trait from his dad. daughter is also enjoying mangoes to the fullest. Now you understand why I am coming up with so many mango recipes.This weekend went in visiting friends and relative. I hardly got any time to cook anything. I had some granola at home and wanted to try some parfait using that. But then when I saw mangoes , the idea of mango parfait was completely obvious. So I thought about granola ,yoghurt and fresh fruit parfait and ended up doing this mango cheesecake parfait. And this is not the first time something like this happened.Most of the time I think about preparing one thing for weeks and then I twist the ingredients and process making something entirely different. 🙂 . Does it happen with you too ?Now let me tell you why the chocolate cookie base ? When you have a toddler at home, you should always be ready to witness funny new things every day. My daughter has started liking Oreo cookies and this is how is how she eats them. Separate the cookies, safely put the one without cream back into the jar and eat the other half. And when you see her licking the cream, you really can’t do anything but smile. So I had almost a jar full oreo cookies and other chocolate cookies. You can use any kind of chocolate cookies or even plan graham cracker/digestive cookies. 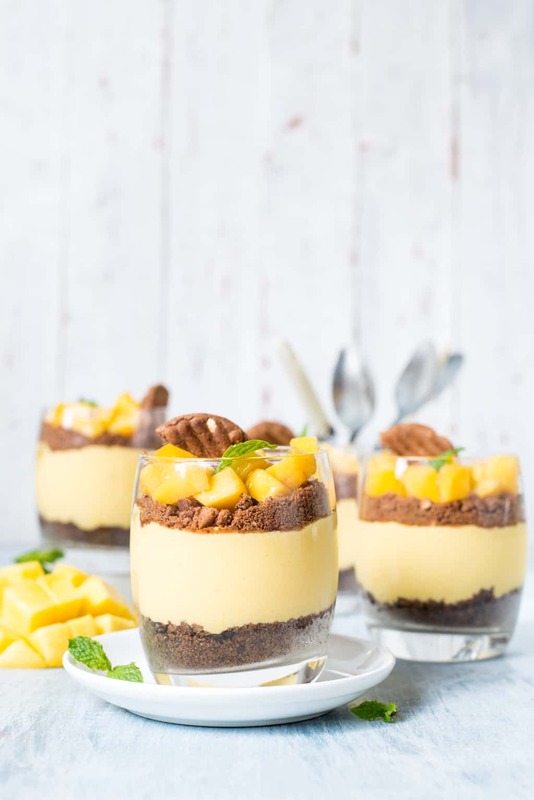 Mango CheeseCake Parfait : Simple and quick layered dessert parfait with the chocolate cookie base and creamy mango cheesecake filling. Mix well Cookie crumbs and melted butter. Spoon 2.5 table spoon of mixture into th serving glass. Press lightly with hands. In a food processor puree the mango pulp. In a big mixing bowl add cream cheese, heavy whipping cream, sugar and sweetend condensed milk. Whip on high speed for 2-3 minutes. Fold in half of mango chunks in to the mixture using a spatula.Devide the mixture among the serving glasses equally. Spoon remaining cookie crumb equally among all the glasses. Chill overnight or atleast for 6 hours. Just before serving top with fresh cut mango chunks. I am literally drooling on the screen Subha. 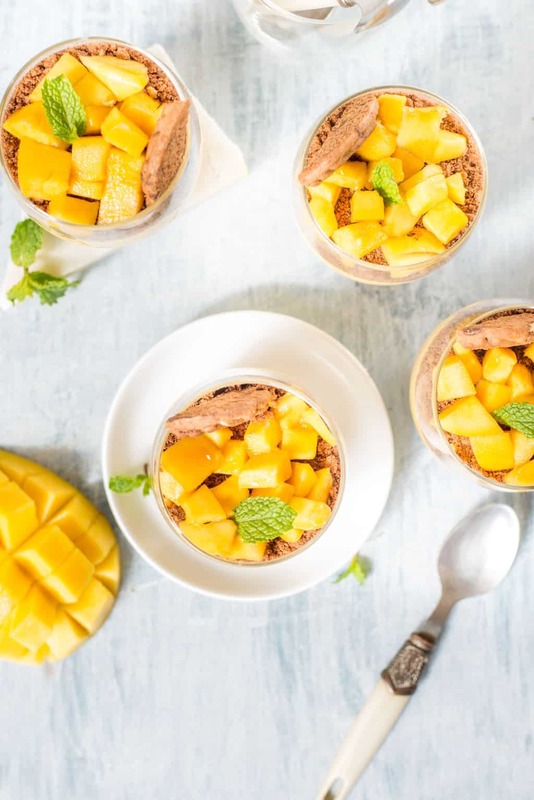 Even I am flooding my blog with tons of mango recipes back to back. And why not? The first pic is just calling me aloud!